Appeared in the Tuscaloosa News on May 6, 2004. DAHLONEGA, GA. | Ruth C. Brice, age 97, of Dahlonega, Georgia, a former long-time resident of Tuscaloosa died May 1, 2004. She is preceded in death by her husband, Norvelle Brice and two sons, James A. Brice and Forrest W. Brice. Survivors include one son, Peter S. Brice of Gulf Shores, ten grandchildren, 13 great grandchildren, and three great great grandchildren. Funeral services will be graveside Monday, May 10, 2004 at 2:00 p.m. at Liberty Cemetery in Oneonta, Alabama. Rev. Reid Crotty will be officiating. In lieu of flowers, the family request that donations be made to Forrest Lake United Methodist Church in Tuscaloosa or to the United Daughters of Confederacy. 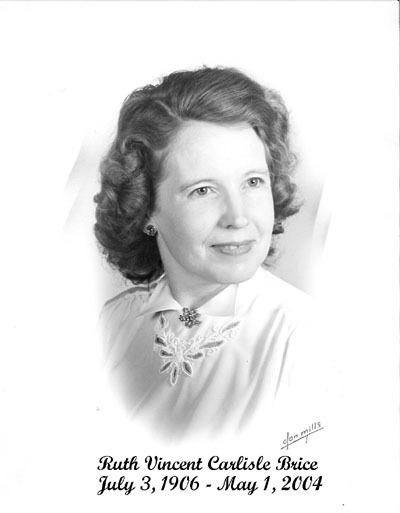 Ruth C. Brice, 97, of Dahlonega died Saturday following an extended illness. in Lineville, Alabama Judge Hiram M. EVANS & Rev MORE, daughter of ALSEY* DEAN and LACY* HUDSON. She was born December 26, 1873 in AL, Clay Co, and died September 23, 1958 in AL, Anniston, Calhoun Co..
More About JOHN WARREN* CARPENTER: *Donna Cuzze's line. shown age 38 AL-AL-AL, John age 9 AL, George H. age 5 AL, Oscar age 3 AL, Sissie age 1 AL. A. 3, Cecil L 1. Arthur 8, Lessey 2, dil: Maudie 18. CENSUS-5: 1930, AL, CLAY FOX CREEK, John W 58 , Irena V 57, Roy S 16, Zach W 14. LAND-1: Bet. 1871 - 1941, Dad says his grandpa never owned land as he was a sharecropper mostly in Barfield. 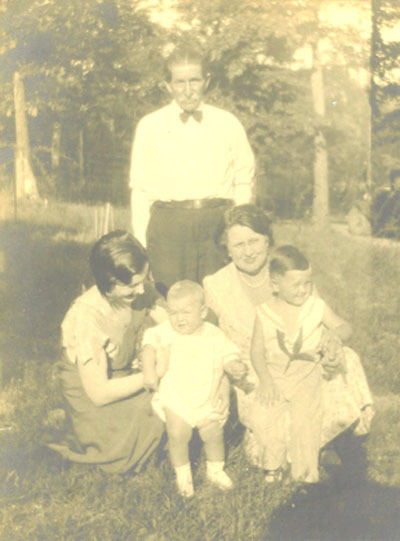 PHOTO-1: 2007, Copies from Lamar Carpenter & Sharon Boling of John & Viola Carpenter and their children. RECORD-2: February 12, 1910, Named in probate of his father, Z.T. Carpenter, will. 104:1 No. 4 (Iezora T Aug 1879 AL in hh of Thomas A Dean). p 394 no death date although cemetery was surveyed in 1980.
p 3; obituary the Ashland Progress 1 Feb 1973. "Charles Thomas was his name, but he was Pa to me and all of his other grandchildren. I have very positive memories of Pa. Mostly, I remember that he was a stern no nonsense man, but still I knew, even as a 10 year old boy, that Pa loved his family. Everybody knew who was the head of the family. I know now that it was he who made sure that our family stayed close, and to this day, my Carpenter family is still close knit because of him. He was a good man, and I am proud to say that Charley Carpenter was my grandfather. I regret that I was too young to know I should ask him questions about the family, and I am also sorry to say though that the most vivid memory I have of him is the day he died. I must have sounded excited because she came running and went out to see what was wrong with him. In just a second, she came running back in and told me she was going to take Pa to the hospital and to tell Mom and Dad what happened and where she was. She had to drive Dad's car because Pa had left his Studebaker at the little market about a block away and walked to our house. Everything happened so fast, and I really didn't know what was going on, but I knew something was wrong because Hank had to take him to the hospital. Hank told me later that he was conscious all the way and that he was able to tell her the best route to take because she didn't know where the hospital was. He must have been a great deal of pain or he knew what was happening to him because she said that he wanted her to run all the traffic lights. She said she was afraid to do that, but she did go as fast as she could. On the way to the hospital, the car ran out of gas about a block away. Fortunately though, a man and his wife came by and offered to take them the rest of the way to the hospital. Hank helped Pa out of our car and into the other car. He was so sick that he vomited in the floor of the back seat. When they got to the hospital, Hank ran in to get help and some nurses came out and helped him inside. After she made sure that he was taken care of, she ran back outside to thank the couple for their help and to clean out their car. They had already left and to this day, we don't know who they were. They must have been very caring and compassionate people though, and I am sure they know that our family appreciated what they did. Back home--when Mom and Dad came home a little after 2:30, I told them about Hank taking Pa to the hospital and they quickly got ready to go see him. After that, it's all a blur, but I remember the next morning, Dad told me that Pa had died the night before. Later, my Aunt Sara told me that she and my Aunt Nell were in the room about 11:45 P.M. when a nurse asked them to leave the room just before he passed away. John B. 6, Lacy F. 4, Sallie A. 3, Cecil L 1. CENSUS-2: 1910, AL, Clay Co, Ashland, living in parents household. MILITARY: 1917, WWI draft registration Clay Co. AL. possession of Donna Carpenter Cuzze. John B. Carperter, 87. a native of Alabama, but a resident of the Anaheim and Fullerton area for twenty years, passed away at a local hospital May 30, 1981. He is survived by his wife, Mable Carpenter of Fullerton; two sons, Lamar Carpernter of Fullerton and Fred Hawthorne; three brothers, Roy Carpenter, Cecil and Zakie Carpenter all of Alabama; four sisters, Sally Haines, Noble Hallmark and Lessie Hampton all of Alabama and Eula Hallmark of Iowa; five grandchildren and ten great-grandchildren. Funeral services were conducted from the Hilgenfeld Mortuary Chapel Tuesday, June 2, 1981 at 10:00 a.m. with Mr. William R. Clark of the Church of Christ officiating. Interment followed at the Anaheim Cemetery. From Sharon Boling: When we got bored... Pawpaw would take us to the garage and tell us stories about when he was a kid. He did this to keep us from getting whipped, as he was the kindest man you have ever met.... Pawpaw always had a bowl of candy on the coffee table for us and could peel an apple without breaking the ring No one was ever blessed with a better family than I had. 'Papa' (as I called him) was listed in the 1920 Clay Co Census at age 25. Occupation was crushing operator at the graphite mill. Nanny was 22. Fred was 4 yrs 6 mos. Aunt Lillian Patterson's family is listed on the same page as well as Papa's great grandmother Mattie and his great aunt Beatrice. 1870 ALA Clay Co. Census -No Township -Lineville P.O. #130-137 page 233 CARPENTER, S. (F) age 50 Keeps House b. GA Mathenia C. (F) age 26 b. GA cannot write David H. (M) age 19 Works farm b. ALA James W. (M) age 14 Works farm b. ALA cannot write MORGAN, Judy (F) age 73 b. GA cannot write / read #139-138 page 233 CARPENTER, Z. T. (M) age 21 Farmer b. GA cannot write Martha (F) age 20 Keeps House b. ALA JOHNSON,James (M) age 18 b. ALA attended school w/in yr.
Research note* 3 Nov 2011� Burial: Cemetery on Sycamore St. Anaheim, CA. Grave #3 Lot 150. 14, Salley 13, Cecil 11, Arthur 8, Lessey 2, dil: Maudie 18. 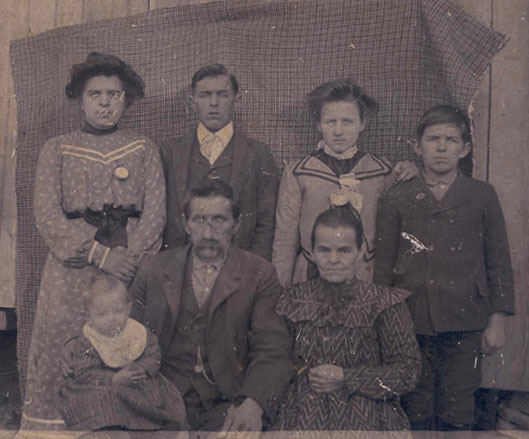 CENSUS-3: 1920, AL, Clay Co, Coppermine, John B age 25, Maybel 22, Fred 4.
children, living in Pyriton, works at Carbon Mtn Graphite Mine. 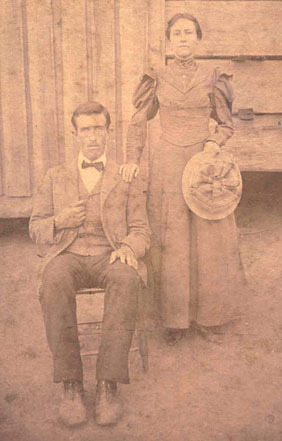 Namesake: 1894, 3rd Grt Grandmother was Jane BARNETT on his father's line. PHOTO-1: 2007, Lots of photos in possession of son Lamar Carpenter. RECORD-1: 1894, Named after his mother's brother Barnett DEAN. Biography* � Mabel was the salt of the earth. She was strong and stubborn but had a weak spot for whoever belonged to her. She used to make us chocolate pie with meringue topping. She always made my favorites like rice pudding and yellow squash. One might say she spoiled me as she rocked me until I was old enough that my feet hit the floor. When Barney and Mabel got married they received some chickens, a sack of corn seed, flour and all the essentials. AL, Alva L 1893 AL, Mabel V 1898 AL. 15, Mabel 12, Earnest 9, Elston 7, Leon 4, Comer 2 . Mrs. J.B. Carpenter b. 4-9-1898. Biography* � Lacey had twins that were so small when they were born, they had to be carried around on pillows. When one of her children was born, Lessie was sent to help her. Lessie lit a kerosene lamp, and somehow the flame got down in the bottom of the lamp with the kerosene. She had to throw the lamp into the fireplace to keep from burning the house down. Christine 1921, Catherine 1923, JC 1926, Wallie 1928. PHOTO-1: 2008, Photos of Uncle Cecil in possession of Lamar Carpenter. tornado to Uncle Cecil's house that had been damaged by the storm. Biography* � Arthur was employed for 40 years by the Alabama Pipe Company and was a superintendent in the foundry in Talladega before being moved to the Anniston plant. He developed a brain tumor that was removed, but he was left so that he had very little speech. He loved Homer, Lessie's husband. When Homer would go to the doctor, Lessie would go by and visit Arthur and Beulah. Arthur called Homer "Hickey." One week they ran late, so that Lessie had to go in without Homer. Arthur began calling "Hickey, Hickey." Lessie told him Homer would be back. When dinner time came, Homer wasn't back. Lessie went in and started to sit by Arthur. He covered the chair with his hand and said, "No, no, Hickey." Lessie sat down on the other side, but Arthur wouldn't eat until Homer came back. He was all smiles then. CENSUS-2: 1920, AL, Clay Co in household of parents. Email 1: 1998, dbcarpen@aol.com Don Carpenter, son of Arthur.